Primary biliary cirrhosis (PBC) is an immune-mediated chronic progressive inflammatory liver disease that leads to the destruction of small interlobular bile ducts, progressive cholestasis, and, eventually, fibrosis and cirrhosis of the liver without medical treatment commonly necessitating liver transplantation. PBC is characterized by biochemical markers of cholestasis, serum anti-mitochondrial autoantibodies (AMA) directed against the E2 subunit of the pyruvate dehydrogenase complex (PDC-E2), and lymphocytic infiltration of the portal tracts of the liver. Histologically, the hallmark of the disease is damage to biliary epithelial cells and loss of small intrahepatic bile ducts accompanied by significant portal tract infiltration with CD4 and CD8 T cells, B cells, macrophages, eosinophils, and natural killer cells. Being one of first conditions in which specific autoantibodies were recognized, PBC is regarded as a “model autoimmune disease”. Both environmental and infectious factors, and inherited genetic predisposition appear to contribute to its pathogenesis. PBC occurs in individuals of all ethnic origins and accounts for up to 2.0% of deaths from cirrhosis. It primarily affects women (female preponderance 9-10:1) with a peak incidence in the fifth decade of life, and it is uncommon in persons under 25 years of age. Incidence and prevalence vary strikingly in different geographic regions, ranging from 0.7 to 49 and 6.7 to 402 per million, respectively. The highest incidence and prevalence rates are reported from the UK, Scandinavia, Canada, and the USA, all in the northern hemisphere, whereas the lowest was found in Australia. Once that the disease has reached advanced stages, the complications can be both metabolic, mainly secondary to long duration cholestasis, both related to the same cirrhosis. These last include fat-soluble vitamins malabsorption, particularly of vitamin D3, caused by an insufficient secretion of bile and bile salts, with steatorrhea, and, in some cases, severe osteoporosis, portal hypertension and hepatocellular carcinoma. Finally, PBC can be associated in about 30% of cases with other autoimmune diseases such as Sjogren’s syndrome, Raynaud’s phenomenon, systemic sclerosis, autoimmune thyroiditis, rheumatoid arthritis. 3. liver biopsy with compatible histological picture. The diagnosis of PBC is made “with confidence” when all the criterions are satisfied, while the term “probable” PBC is used when only two criterions are satisfied. The differential diagnosis is set with all the diseases characterized by signs of intrahepatic cholestasis and particularly with all those forms characterized from pruritus and from increase of the alkaline phosphatase, such as primitive and secondary neoplasies of the liver, bone metastasis, Paget’s illness. Another condition that asks for a differential diagnosis with PBC is the primary sclerosant cholangite, in which nevertheless AMA are always negative. Serum alkaline phosphatase and gamma-glutamyl transferase are commonly elevated and define, together with AMA, the diagnosis of PBC. Mildly elevated serum aminotransferases (ALT/AST) are usually observed in PBC but are not diagnostic. Increased serum levels of (conjugated) bilirubin as well as alterations in prothrombin time and serum albumin (decreased) are late phenomena in PBC like in other cirrhotic states and unusual at diagnosis. Serum cholesterol is commonly elevated in patients with PBC, alike other cholestatic conditions. The increased cholesterol level is largely caused by the presence of LpX, an abnormal lipid particle which is characteristic for cholestatic liver disease and that is directly derived from biliary lipids that regurgitate into the blood. The increased serum cholesterol in PBC patients is associated with the occurrence of xanthomata and xanthelasma. The ceruloplasmin is always increased and reflects the increase of the copper deposits intrahepatic. The ipergammaglobulinemia, mainly owed to the increase of the IgM, is present, in varying degree, in the totality of the cases. AMA autoantibodies are pathognomonic for PBC and lead to the diagnosis with a high specificity and sensitivity. AMA-positive individuals, even if no signs of cholestasis and/or liver inflammation are present, are very likely to develop PBC. Mitchison et al., in a small study, evaluated liver pathology of 29 asymptomatic AMA-positive (levels >1:40) individuals lacking alkaline phosphatase elevation. At inclusion, all but two had abnormal liver histology, and in 12, findings were diagnostic for PBC. A 10-year follow-up of these subjects revealed that 24 of the 29 remained AMA-positive; all 24 developed biochemical evidence of cholestasis and 22 became symptomatic, confirming a high positive predictive value of positive AMA testing for the development of PBC. The AMA represent a heterogeneous group of autoantibodies working against antigens located on the mitochondrial membrane. According to their immunochemical structure, such antigens have been classified in different types indicated with the abbreviations from M1 to M9. Only anti-M2 antibodies (specificity for pyruvate dehydrogenase), anti-M4 (specificity for solphito-ossidase), anti-M8 and anti M9 (specificity for glicogeno-phosphorilase) are however specific for PBC. Among these, only the anti-M2 have diagnostic importance being present at high title in almost all the patients, while the others three can be at low title and however are never alone, but always with the anti-M2. The M2 antigen actually consists of different auto-antigens that belong to pyruvate dehydrogenase complex. 3. enzymatic system E3 (diidrolipoil dehydrogenase) with cofactors FAD and NAD+. The three subunits constitute the principal components of M2 antigen that are responsible for the appearance of AMA. The so far identified targets of AMA are all members of the family of 2-oxo-acid dehydrogenase complexes (2-OADC). This includes the E2 subunits of the pyruvate dehydrogenase complex (PDC-E2), the branched chain 2-oxo-acid dehydrogenase complex (BCOADC-E2), the 2-oxo-glutaric acid dehydrogenase complex (OGDC-E2), and the dihydrolipoamide dehydrogenase binding protein (E3BP), all localized within the inner mitochondrial matrix, catalyzing oxidative decarboxylation of keto acid substrates. All the targeted E2 subunits have a common N-terminal domain containing single or multiple attachment sites for a lipoic acid cofactor to lysine. Studies have demonstrated that the dominant epitopes recognized by AMA are all located within these lipoyl domains of the target antigens. 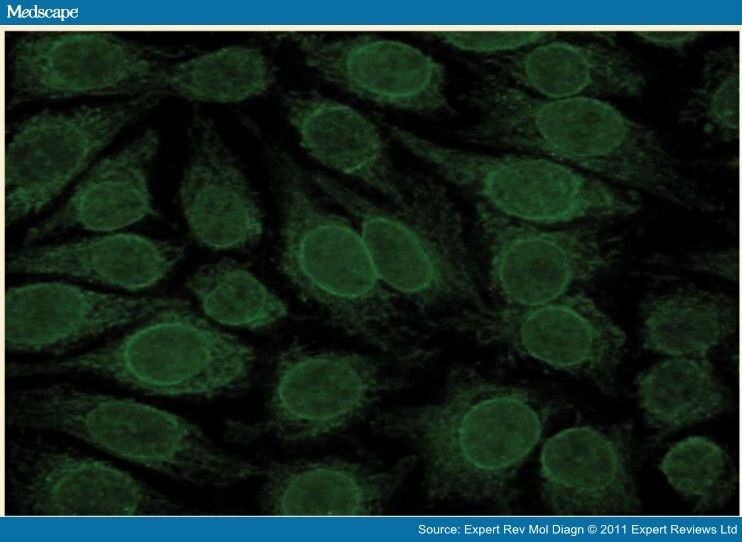 Immunofluorescence test is the initial method used for detection of AMA in the serum. 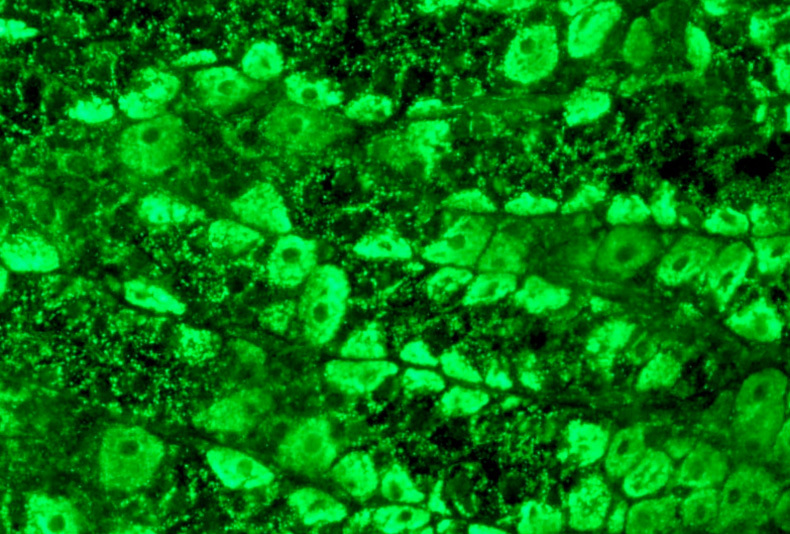 The method of indirect immunofluorescence (IFI) is based on the ability to underline antibodies direct toward specific antigens presents in different substrata, adhered to slides, that consist of sections of animal tissues or of cells in culture, through the use of anti-human immunoglobulin antibodies conjugated with a fluorescent substance. 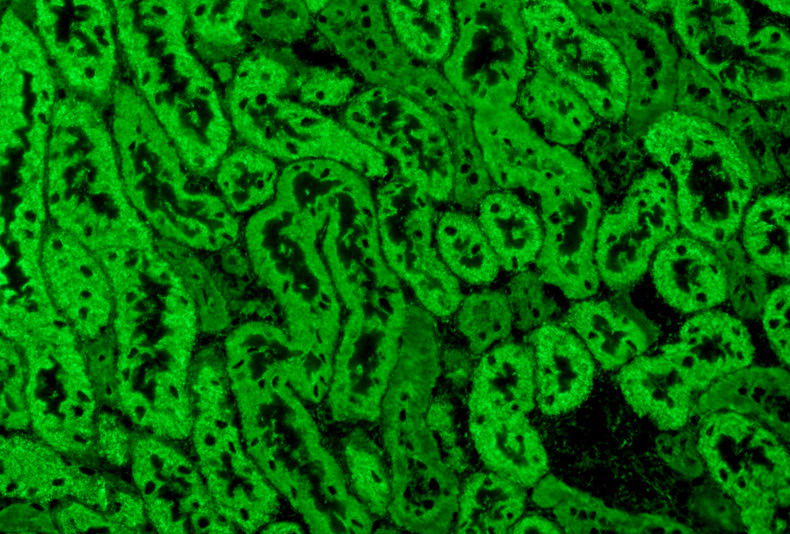 For detection of AMA, kidney/stomach/liver tissue sections of mouse and cellular lines HEp-2 are used. On the sections of kidney of mouse, the antibodies anti-M2 are responsible of a cytoplasmic fluorescence of granular aspect interesting all the tubular cells but more intense at the distal renal tubules’ epithelium. On the sections of stomach, in presence di AMA, a picture of diffused fluorescence is observed interesting both wall cells both those principal. On the sections of liver, AMA have a more granular aspect. 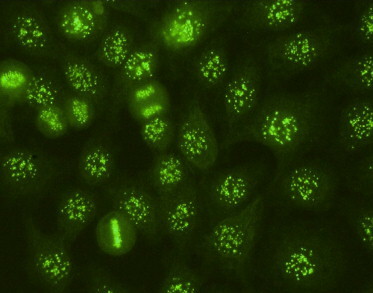 On HEp-2 cells the presence of AMA is characterized by a granular filamentous pattern staining extending around the nucleus and throughout the cytoplasm. The contextual analysis of the three principal tissues and of HEp-2 cells generally allows a correct interpretation of serologic picture, but in all cases of positivity it is necessary to confirm the diagnostic suspicion through the use of more specific methods as ELISA or dot-blot, that use the M2 antigen as substrate. While in PBC AMA are always at high title (>1:40), they can be found at low title (1:20-1:40) in 30% of the subjects with active chronic hepatitis and occasionally, in the hepatitis from drugs (alotano, clorpromazina, sulfonamide). Several studies have shown that the AMA can appear during the asymptomatic phase of disease and before biochemical signs of liver damage appear. Particularly it has been underlined that all the AMA positive patients, also without biochemical interactions, have already histological lesions compatible with PBC or will develop a clinical picture of PBC in the years. The predominant autoreactive antibodies in PBC are AMA, but a subgroup of patients’ sera are positive for antibodies direct toward nuclear components (ANA) that at indirect immunofluorescence produce homogeneous, nuclear dot, speckled, centromere, or rim-like patterns. During the last two decades, a number of nuclear structures have been recognized as specific targets of ANA in PBC. These include the protein Sp100 (Speckled protein 100 kDa) and PML (Promyelocytic Leukaemia protein), located in the nuclear bodies, and two components of the nuclear pore complex, gp210 (glyprotein 210) and NP62 (nucleoporine p62). 43% of the patients are positive for antinuclear antibody. Of these, 35% have antibodies against Sp100 and 36% are positive for anti-gp210. 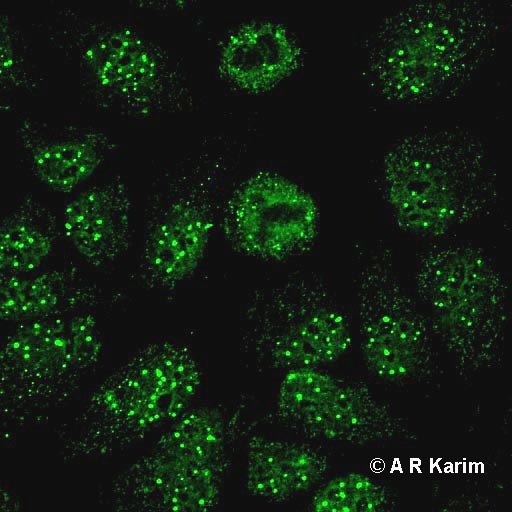 On HEp-2 cells the anti-Sp100 produce a multiple nuclear dot immunofluorescent pattern characterized by the fluorescence of 5-20 points of varying dimensions distributed inside the nucleus. 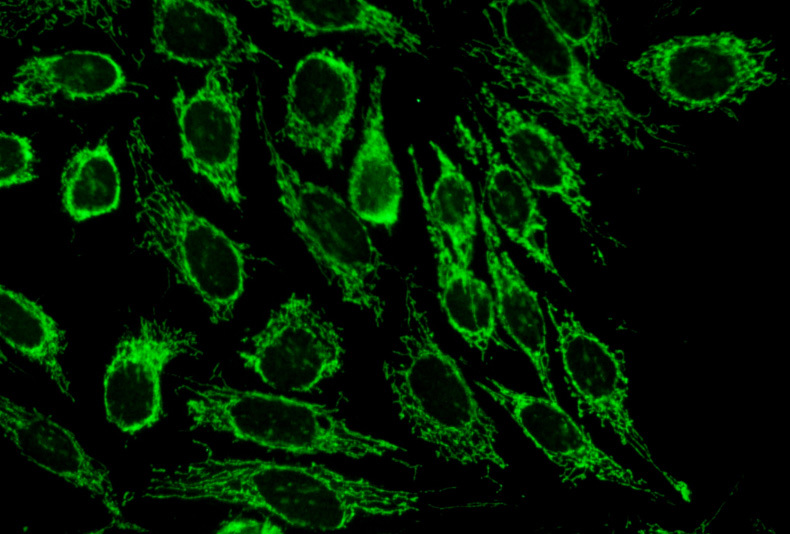 The presence of anti-gp210 and NP62 on HEp-2 cells is underlined with the immunofluorescent rim-like membranous pattern, characterized by the linear fluorescence of the nuclear membrane. The important thing is that such reactivities (for protein Sp-100 sensitivity 21-34%, specificity 95-98%; for proteins gp210 and NP62 sensitivity 13-44%, specificity 90-100%) are present not only in AMA positive patients but also in those AMA negative and so they are considered to be specific for the disease. Their presence, neglectable for the diagnosis of PBC in presence of AMA, becomes important in AMA negative cases, because it allows a positive diagnosis for a meaningful number of cases that can reach until 30-40%. Moreover anti-Sp100 and anti-gp210 are not detected in sera of patients with autoimmune hepatitis, hepatitis C infection, inflammatory bowel disease, connective tissue disease, or primary sclerosing cholangitis. The positivity for anti-Sp100 and gp210 observed in IFI, must be always confirmed with immunochemical methods (ELISA or dot-blot) that have more analytical specificity than IFI. Approximately 10% of the patients with PBC has anti-centromere antibodies direct toward the antigen associated with systemic sclerosis. The reason why these antibodies are present in a subgroup of patients with PBC that will never develop clinical manifestation of systemic sclerosis is unknown. Anyway the presence of anti-centromere antibodies, besides systemic sclerosis, must suggest PBC and must include it in the differential diagnosis. Histological staging of PBC (stage1 to stage 4) is determined by the degree of periportal inflammation, bile duct damage and proliferation, and the presence of fibrosis/cirrhosis according to Ludwig et al. and Scheuer. Stage 1 disease is characterized by portal inflammation with granulomatous destruction of the bile ducts, although granulomas are often not seen. Stage 2 is characterized by periportal hepatitis and bile duct proliferation. Presence of fibrous septa or bridging necrosis is defined as stage 3 and cirrhosis as stage 4. Findings of fibrotic or cirrhotic changes (stage 3 or 4) are accompanied by a worse prognosis. Florid duct lesions as defined by focal duct obliteration and granuloma formation are regarded as typical for PBC. The liver is not uniformly involved, and features of all four stages of PBC can be found in one biopsy specimen. A liver biopsy is not anymore regarded as mandatory for the diagnosis of PBC in patients with elevated serum markers of cholestasis and positive serum AMA, but may be helpful in excluding other potential causes of cholestatic disease and in assessing disease activity and stage. Several immunological phenomena have been described in PBC among which the anomalies of the innate immune answer and the presence of autoreactive anti-PDC-E2 B and T cells, suggesting the existence of a generalized autoimmune trial both humoral (the humoral autoimmunity is direct against not-organ specific autoantigens: mitochondria and nuclear antigens) both cellular (immunoreactions mediated by type III mechanism with deposit of immunocomplexes and complement in the target organ, and type IV mechanism mediated by lymphocytes T cytotoxic). Although the etiology is unknown, it is by now approved that PBC is an organ-specific autoimmune disease, in which the exposure to environmental infectious factors (bacteria and virus), chemical-physical factors (UV, smoke, drugs), food, cause the breakup of the immunological tolerance towards PDC-E2. A potential direct toxic effect of xenobiotics my cause cell death by apoptosis or oncosis, inducing the generation of immunogenic autoepitopes. In addition, chemical modification of native cellular proteins by removal and/or exchange of hapten has been shown to change processing in antigen-presenting cells and may lead to the presentation of cryptic, potentially immunogenic peptides. Furthermore, xenobiotics may have the potential to modify host proteins to form neoantigens. Neoantigen-specific T cells and B cells, once primed, may cross-react with the formerly inert native autoantigens. 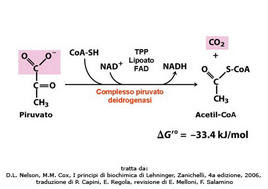 In accordance with this hypothesis Amano et al. studied a number of xenobiotics with a structure similar to lipoic acid, a residue on the E2 epitope of the pyruvate dehydrogenase complex (PDC-E2 ),the main autoreactive antigen identified so far in PBC. Replacement of lipoic acid by certain xenobiotics enhanced the reactivity of PBC sera against the PDC-E2 epitope. 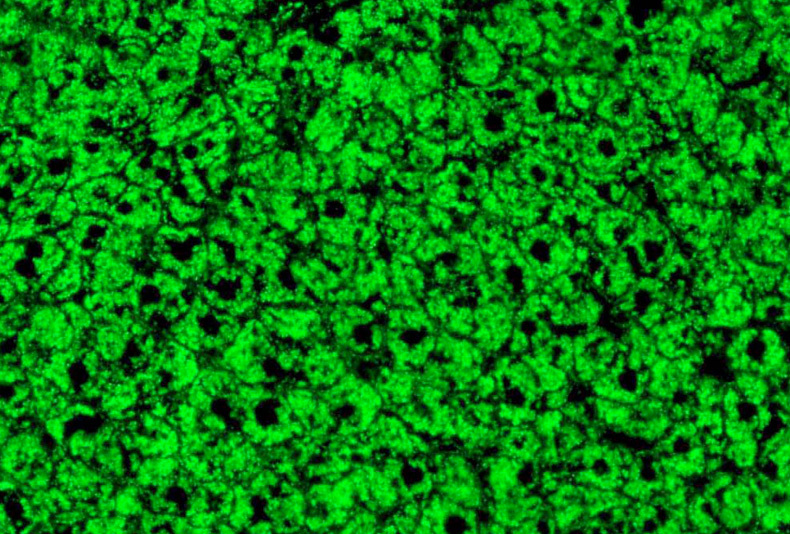 Retroviral infection hypothetically could cause BEC damage either through a direct viral cytopathic effect, through cross-reactivity between viral protein and self-PDC, a “molecular mimicry” model, or virus-induced apoptosis that may lead to exposure of otherwise rarely exposed antigens and induction of immune response to self. There is strong and compelling evidence to support molecular mechanisms of cross-reactivity between the PDC-E2 lipoic acid co-factor and environmental xenobiotics inducing auto-immunogenity of modified self-PDC-E2. Animal modeling data would argue that a cross-reactive B cell response induced to xenobiotic-modified self-PDC can, through a process of epitope spreading driven by antigen-specific cross-reactive B cells, translate into the breakdown of T cell tolerance responsible for the effector T cell mechanisms thought to be directly responsible for BEC loss. Alternatively or in addition, molecular mimicry mechanisms with cross-reactivity between self-PDC and bacterial or potentially viral structures may support or induce breakdown of tolerance. Most data on genetic associations with disease point to loci or genes involved in immune function. Altered regulation of self-tolerance can possibly support or induce immune reaction against self-PDC-E2, expressed normally or aberrantly by BECs. Primary events of cholangiocellular apoptosis or cell damage have been suggested that could lead to aberrant presentation of self-antigens or create an inflammatory environment potentially triggering immune dysregulation. Finally, functional and morphological changes in BECs, either as an associated process to outlined factors or as part of the homeostatic mechanism designed to retain BEC function, may lead to altered self-recognition. Each of these mechanisms may occur simultaneously or sequentially and, to a variable extent, result in the breakdown of tolerance and immune-mediated liver pathology. Once an autoimmune reaction is initiated, various vicious cycles are conceivable. Inflammatory reaction secondary to loss of tolerance will lead to further cholangiocellular damage and apoptosis, increasing presentation of (altered) self-PDC and increase autoreactivity. Once bile duct loss and cholestasis are established, retention of bile salts and other toxic compounds perpetuates damage to BECs and subsequently to the entire liver. Maintenance of these vicious cycles may be supported by an immune system that is genetically dysregulated and insufficiently capable of suppressing autoimmune reactions. The outstanding paradox in PBC pathogenesis remains the tissue tropism of the immune attack on the small intrahepatic bile ducts, although the mitochondrial targets are ubiquitously expressed proteins. Apoptosis of BECs has been proposed as a cause of aberrant neoantigen presentation, responsible for activation or attraction of autoreactive T lymphocytes or antibodies. Genetic associations in PBC are shown with major histocompatibility complex (MHC or HLA) encoded genes, in particular with HLA DRB1 alleles. Associations have also been reported with polymorphisms of genes involved in innate or adaptive immunity. Allelic variations of tumor necrosis factor alpha (TNF alpha) and of cytotoxic T lymphocyte antigen 4 (CTLA-4),a key regulator of the adaptive immune system, have been associated with susceptibility to PBC. Most recently, associations with the risk of disease were unraveled for 13 loci across the HLA class II region, two SNPS at the interleukin 12 alpha (IL 12A) locus, one SNP at the interleukin 12 receptor beta 2 locus, and one previously described SNP at the CTLA-4 locus. The clinical course and the evolution of PBC are very varying, with slow progression cases that last decades and cases that have a rapid and very severe course. Ursodeoxycholic acid (UDCA) is currently the only FDA-approved medical treatment for PBC. When administered at adequate doses of 13-15 mg/kg/day, up to two out of three patients with PBC may have a normal life expectancy without additional therapeutic measures. The mode of action of UDCA is still under discussion, but stimulation of impaired hepatocellular and cholangiocellular secretion, detoxification of bile, and antiapoptotic effects may represent key mechanisms. One out of three patients does not adequately respond to UDCA therapy and may need additional medical therapy (corticosterioids and other immunosuppressive drugs, calcium and vitamin D supplementation) and/or liver transplantation. Liver transplantation is the chosen treatment in patients with late-stage PBC. Indications are decompensated cirrhosis with treatment-resistant ascites, recurrent spontaneous bacterial peritonitis, encephalopathy, recurrent variceal bleeding, or hepatocellular carcinoma and severe osteoporosis. The presence of ascites, the levels of bilirubin, albumin and prothrombin time are the parameters more used in clinical practice to predict the patients’ survival, even if they are useful only in the advanced stadium of disease. A close correlation doesn’t exist between the histological stadium and the prognosis; patients with third stadium biopsy are indeed still able to be asymptomatic. Recently it has been suggested that the presence in the initial phase of PBC of anti-gp210 and anti-Sp100 antibodies alone or with AMA, correlate with disease severity and with a worse prognosis. An increased incidence of hepatic and extrahepatic carcinomas in patients with PBC has also been recently shown.